Home Unlabelled What's dragging rupee down: Speculation or economics? Speculation or economics! What's fuelling the persistent fall in the value of the Indian rupee? The reasons, according to experts, are several. But most of them feel the bottom is yet to be tested. "The decline is not just because of psychological factors alone," said Anis Chakravarty, senior director, Deloitte in India. "This is hard economics," Chakravarty said. "There are issues with the Indian economy that need to be addressed." He pointed out that India's current account deficit -- which is the difference between the total imports and exports of goods and services, as also inward and outward money transfers -- jumped more than 10 times in five years. In other words, a net amount of $90 billion equivalent went out of India in 2012-13, as against $8 billion in 2007-08, putting much pressure on the country's foreign exchange reserves that is generally used by central banks to keep currency markets stable. "Foreign funds have withdrawn significant amount of money out of Indian markets in the past couple of months. The trend continued during August. It is evident that alarmingly high levels of current account deficit have been core to this slide," Chakravarty said. 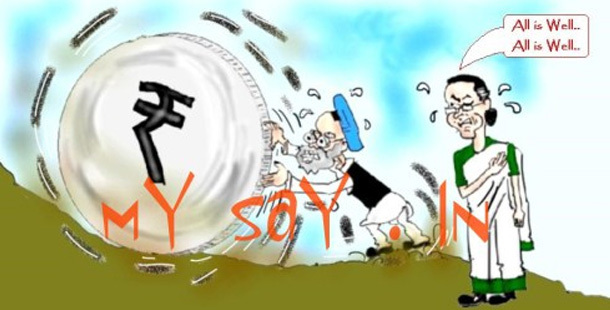 Finance Minister P. Chidambaram Thursday said the rupee is undervalued and has overshot its reasonable limit due to "unwarranted pessimism" in the markets. Some analysts also see the recent volatility as a result of speculation. "It is more of hype and overdone," says Siddharth Shankar, advisor at brokerage firm KASSA. "There was no such economic development in the past couple of months to justify this volatility." "We now believe the rupee could touch 70 to the US dollar in a month or so, although we expect some revival by the end of the year," the German bank said in a report. "No doubt, there are problems with the Indian economy -- growth is low, current account deficit is high. But these things have not come about in the last one or two months. They have been there for a couple of years," he said. India's economic growth slumped to five percent in the financial year ended March 31, 2013. And according to Shankar, growth was likely to remain below five percent in the current fiscal as well. "We expect the depreciation in the rupee to continue until the Indian economic scenario stabilises and when the world markets absorb the impact of the quantitative easing of stimulus process by the US Federal Reserve," Thakkar told IANS. Trimming of stimulus by the US may lead to further outflow from India's equity and debt markets and put more pressure on the current account deficit - and ultimately the rupee. A foreign exchange reserve of $275 billion could prove little to stave it off.